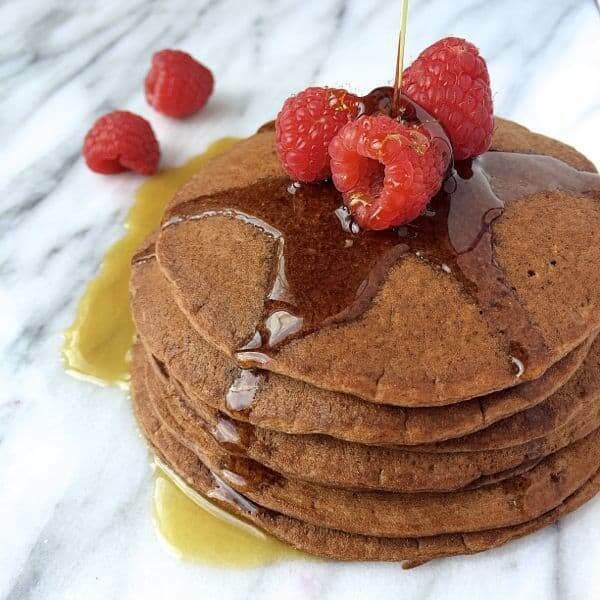 Lunch meets breakfast with these whole grain, protein-packed peanut butter and jelly pancakes. While we don’t eat pancakes every weekend, a few times a month I like to whip up a big batch so that I can stock the freezer with homemade frozen pancakes. Mornings are a bit frantic in our house so I love knowing that I can have a warm, wholesome breakfast ready in just 60 seconds. Lucky for me, my oldest loves to help “Mama mix”. Cooking with toddlers isn’t the tidiest of tasks but I believe it’s important to get your kids in the kitchen at an early age. Friends often ask why my kids aren’t picky eaters and I really believe getting them involved in the cooking process from farm to plate plays a vital role in their attitudes towards food. 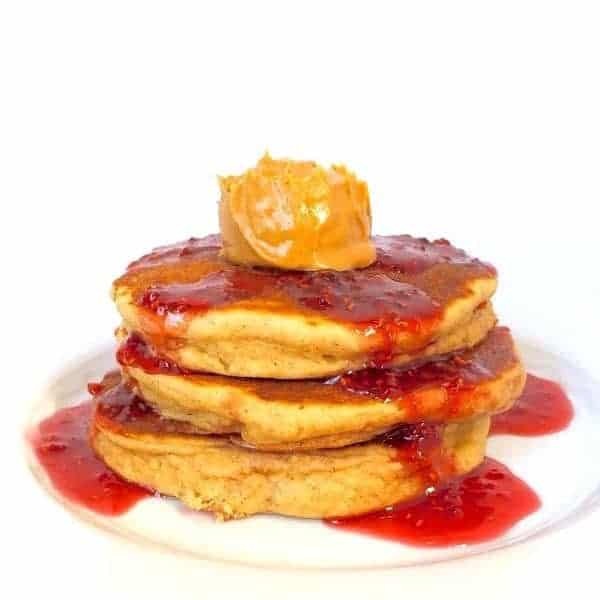 This time of year we often make pumpkin or banana pancakes but I decided to turn my son’s favorite sandwich into breakfast with these Peanut Butter and Jelly Pancakes. Plain yogurt keeps them light and fluffy and natural peanut butter adds tons of flavor, healthy fats and protein. These freeze beautifully so make a double batch and thank me in the morning! 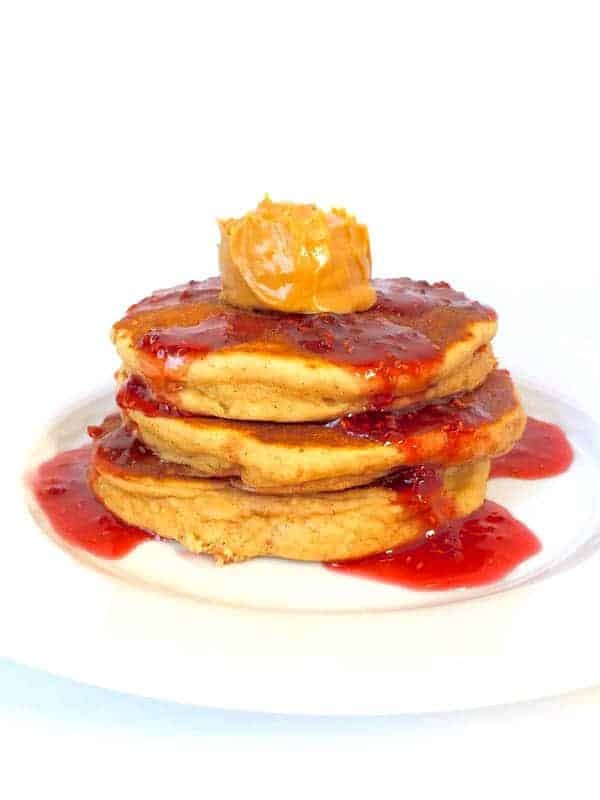 Lunch meets breakfast in these whole grain, protein-packed peanut butter and jelly pancakes. 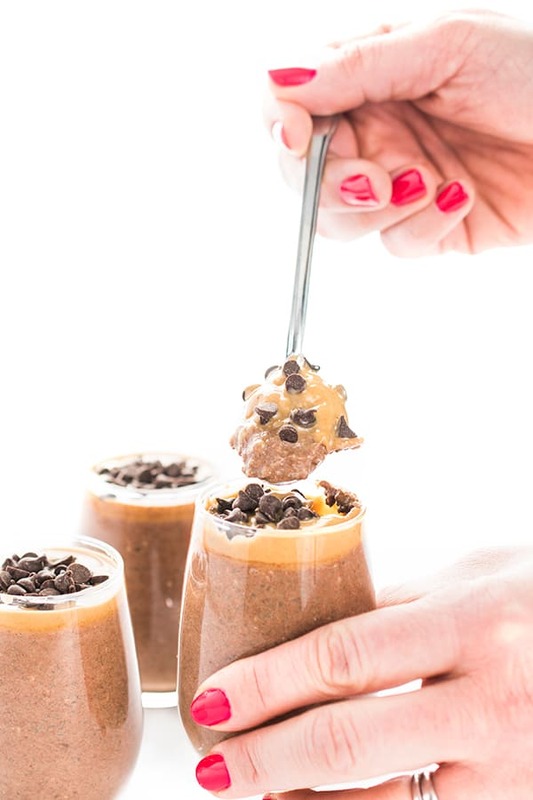 Heat peanut butter in a microwave-safe dish for 30 seconds; set aside. In a medium bowl, whisk together wet ingredients: eggs through vanilla. Add melted peanut butter to the bowl and whisk until smooth and creamy. Slowly add the wet ingredients to the dry ingredients and stir until all ingredients are fully incorporated. Heat a non-stick griddle on medium heat and spray with cooking spray. Ladle batter on to the griddle about 1/3 cup at a time. Heat on first side until bubbles begin to surface then flip. Cook on other side until golden brown, about 2 minutes per side. While pancakes are cooking, microwave raspberry preserves with 2-3 tablespoons water for 45-60 seconds or until warmed through. Whisk raspberry syrup with a fork to remove lumps. Serve pancakes with raspberry syrup and extra peanut butter if you wish. These were a huge hit in my household! They absolutely do keep you full for a long time — can’t wait to see variations on this from you, or maaaaybe try to improvise on my own …. I’m so glad to hear that!!! Yay! 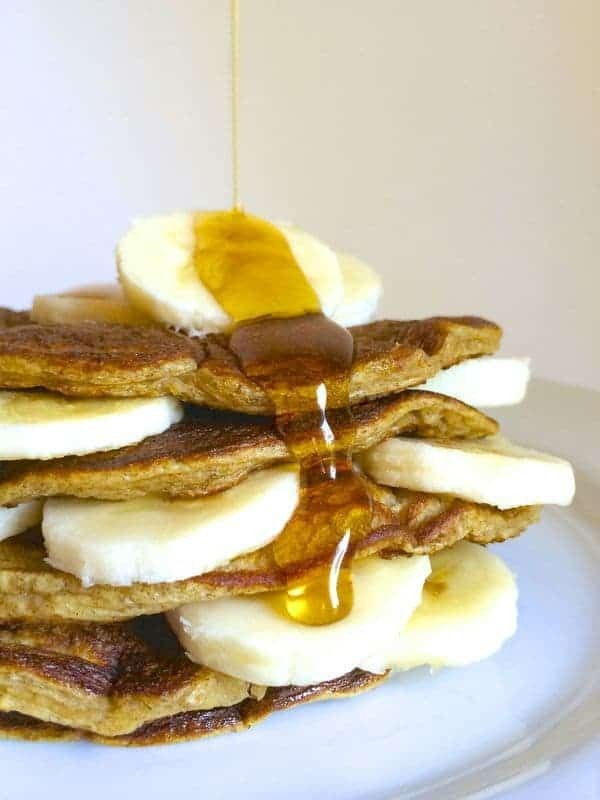 These pancakes look amazing and I LOVE the ingredient list! Is the peanut butter the kind with peanuts and salt only? I’m always amazed how different natural peanut butters are. Mine is a runny mess, even when refrigerated. Girl you and me both!! I definitely agree that getting the kids involved leads to less picky eating! Although, I can’t see how any kid wouldn’t want a big batch of these…I know I do! Wish I could make you a batch! Love the ingredient list on this recipe! Even though I don’t have toddlers, I have one hungry boyfriend who would love these :). I hope you make these for him! I want to make these for you! Oh Liz, these look wonderful! I love the idea of making extra for the freezer! OMG – those boys are adorable! Best kitchen helpers ever! 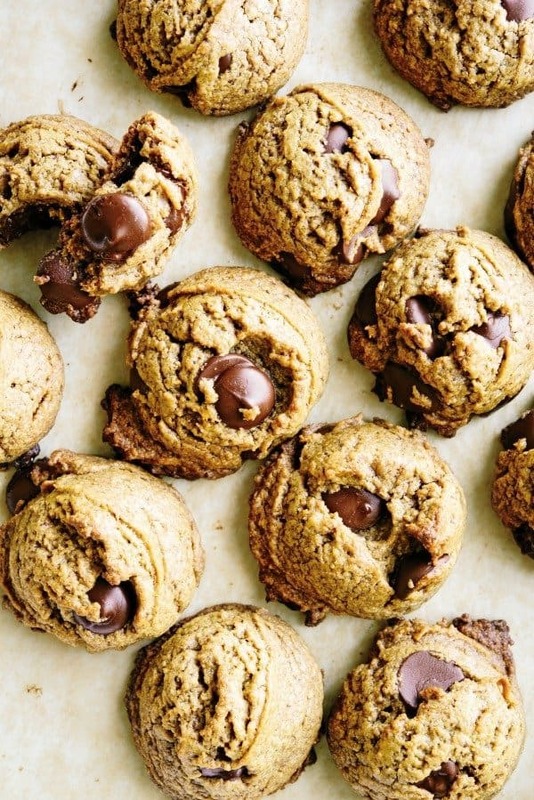 And you could just strap me up with an iv of peanut butter, so you KNOW I’m diggin’ this recipe!! Girl I wish I could be hooked up to an IV of peanut butter!! Heck yes!! Fun breakfast for all! Thank you so much Brianna – let me know if you make any! These look amazing! 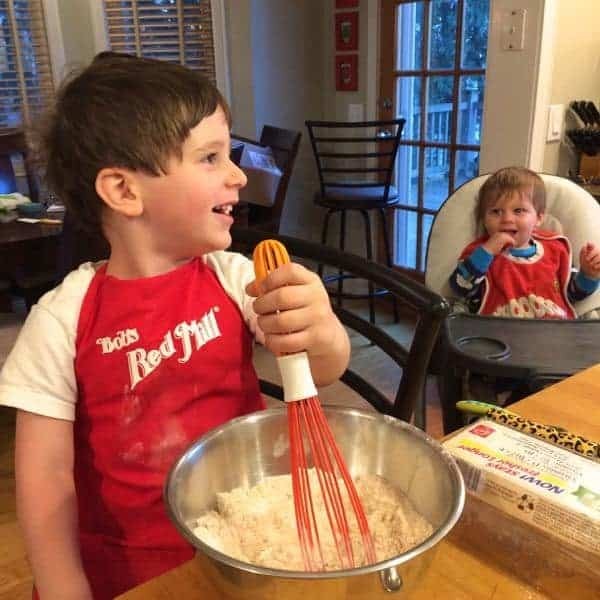 Your kids are such cuties, I can’t wait until my daughter is old enough to be my little sous chef :) Pinning and tweeting now! Aww thank you so much!! I bet she will be sooner than later!! 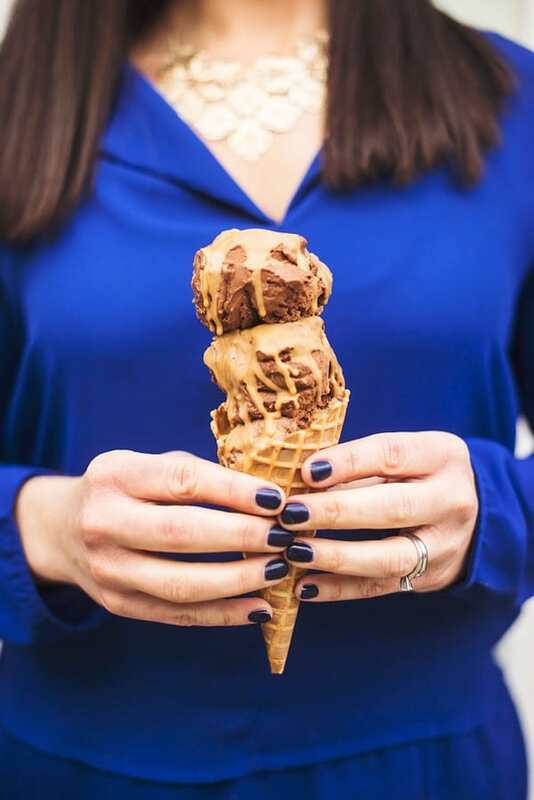 These are a few of my favorite things…DELICIOUS! Can I please have these for breakfast? They look fantastic! Yes girl!! I’ll make you a short stack now! Thanks for including my apple cider pancakes, Liz. I love the idea of PB & J!